In the opening round of the Father’s Day tournament, Winner Junior Teeners defeated Lyman 16-5. Brady Fritz pitched four strong innings and also had a hit and a run scored. Zach Bohnet had 2 hits and 3 RBI’s. Klein had 2 hits and Owen Duffy reached base safely 3 times. 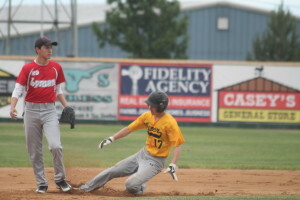 In the semifinal game, Winner was outscored by Platte 20-3. Zach Bohnet pitched four solid innings and Ashton Klein pitched in relief. Coach Jon Hanson said Winner struggled defensively and it shows with eight errors in the game. Fritz had 2 hits and 2 runs scored and Klein had 2 hits. In the final game, Winner lost a slugfest 13-10. Winner played Onida in the third place game on Sunday. Evan Farner, Ashton Klein and Jesse Calhoon shared pitching duties. On the offensive side, Kolbie Osborn and Adam Bohnet had 2 hits each while Fritz finished with 4 hits. Gregory won the Father’s Day tournament with a 5-4 victory over Platte. Bryce Frank’s two out single scored Coy Determan for the win. Earlier, the Winner junior teeners were victorious over Mission 13-3 in a game played last Thursday. Riley Orel pitched two innings and Farner pitched the final inning. Farner had 3 hits, and Michael Olson, Ashton Klein, Zach Bohnet, Charlie Pravecek and Brady Fritz each had a hit. The next action for Winner is Thursday when they will host Gregory at 6 p.m.